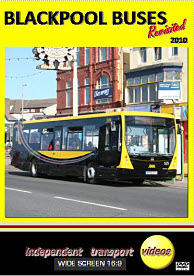 Following on from the success of our first video programme – BLACKPOOL BUSES filmed in 2008, the independent transport videos cameras have made a return visit to Blackpool to record the changes that have taken place to the bus fleet during the intervening years. Firstly, the ‘Metro’ branding has been discontinued as well as the route branded liveries. In their place a modernised version of the ‘generic’ livery of yellow and black has been introduced featuring a modern stylised silver and red sweep separating the two main colours. The first vehicles to introduce this scheme are nine new Plaxton Centro-bodied Volvo B7RLEs, operating mainly on Line 1 and 11 services. These vehicles are featured heavily on this video programme. Other members of the fleet are starting to appear in this new scheme. Meanwhile most vehicles have had their branding removed and now appear on a whole host of different services making it a very interesting time in the town for the local bus enthusiast! Our filming is done by location. We start on Blackpool Promenade, then move into the Town Centre and as before visit Cleveleys, Fleetwood, St Annes and finish at Lytham. Lots of action is captured at all the locations. The older Olympians are now operated mostly on school contracts, where we capture these vehicles running in and out for their duties. Look out for 411 (D367 JJD), the very last body to be built by ECW. This interesting vehicle started life in London as L263 (D263 FUL), then moving to Blackburn, and is now operating in Blackpool. As a post script we film three former Blackpool Corporation Leyland Titans on display at the 125th Celebrations for the Blackpool Trams at Rigby Road Depot. Also caught on film is a nocturnal sighting of preserved Leyland Titan 501 (HFR 501E) running along the Promenade! We hope you enjoy this revisited programme as much as you enjoyed our first visit!